If you want an instrument with remote programmability, consider the Fluke PM 6304 RCL meter. 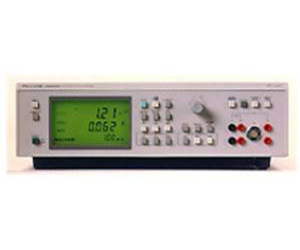 The PM 6304 has a basic accuracy of 0.1%, 3 test voltage levels and 204 test frequencies. The PM 6304C has an even higher basic accuracy, and can measure components or devices with an accuracy of 0.05%. Thanks to this high accuracy, the PM 6304C is idealy suited for calibrating the capacitance sourcing function of the high-performance Fluke 5500A Multi-Product Calibrator.